Valid on 27 February 2012 only. 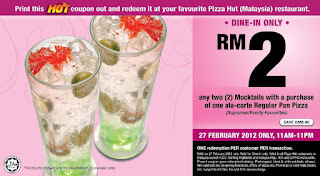 Valid in all Pizza Hut restaurants in Peninsular & East Malaysia except KLCC, Genting Highlands and Wangsa Maju. Photocopied, black & white printouts allowed. Promotion is valid while stocks last. Subject to 6% Gov. Tax and 10% service charge where applicable. Remember to share with your friends yeah!